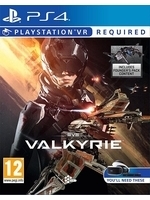 CCP Games has announced that EVE: Valkyrie, the dogfighting virtual reality game, will be included with all Oculus Rift pre-orders. The VR gear launches next year and the game will also release for PlayStation VR later. 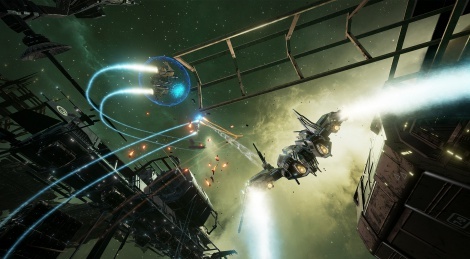 New screens and gameplay video captured with a VR headset inside. Wow this looks really good for a VR game your going to need a beast of a PC to run these stereoscopic visuals maxed out at 75 + fps. One i'm looking forward to on PSVR. Looks great. Be interesting to see how they can get the performance out of the PS4 to make it a viable product. As both Nextgen consoles struggle with single 1080p at 60fps. The game seems to be pretty basic in regards to its assets, i'd imagine it will work fine for that reason alone. I suppose this type of game would be possible on the PS4 and still hit 1080/60 while retaining visual fidelity. There aren't detailed landscapes to deal with like most games, just objects and effects in 'empty space'. I look forward to both devices and I'm sure I'll end up with both. I'm not at all convinced by Hololens yet though. I like the idea of VR...but it's definitely going to be one of those things I try before I buy...and buy it only after it's been out a year or so as they get past the testing phase of what works and doesnt work, and just how supported it's actually going to be. Also price...god knows how much this things gonna cost, but i'd put money on it coming out too high and being half the price a year after launch. Sonys recent stage demo of it did it no favours either...reminded me of that time kinect gave an avitar spasms on stage. I'm still not sold on the whole VR is next level of gaming. However, this looks great. Can't imagine it would look this good on a PS4 VR. Bag that. If I'm going VR its Oculous Rift all the way or bust. I understand what you mean the immersion of VR makes up for the lack of image quality. Can't wait to play Project cars etc. in car with full head movement. going to be amazing. Just wish they would all come up with dates and prices. My new "VR" PC arrived today. Gonna try out a bunch of demo games this weekend on a "real" rig (compared to my old one that couldn't achieve high enough frame rates on most VR games). Can't wait! There's this start-up that has you walk around a real warehouse wearing a v1 Oculus headset and a mock up gun, the game is this rudimentary zombie game that's pretty bad. Even with the bad low-res headset and bad game, it didn't stop me feeling very involved because of the immersion, you can never describe the feeling to those who haven't tried VR with a solid concept game, so I'm not surprised some people are skeptical. But there's one thing I know, I will be buying both Oculus and PSVR, one of the most exciting things to come to gaming in a long time. What system did you have and what have you just got? I've got an old Xeon X5670 O/C to 4.2gig , GTX980Ti and 12 gig of ram. hoping that will own VR on high settings. GTX980Ti and 12 gig of ram. hoping that will own VR on high settings. I spent a lot on a GTX 980 and hopefully i might get a couple frames in tetris, yes hopefully. - my sense of humor.